Smoothies seem super healthy — and they can be — if you do it right. If you’re turning to smoothies as part of your strategy to lose weight or take your healthy eating up a notch, your menu may need a little attention. Done right, smoothies can make nutritious sense, packing satisfying ingredients along with fiber, vitamins, minerals and other health-protecting substances. But even some of the most healthful smoothie ingredients can add up to a lot of calories and therefore, interfere with your weight loss goals — or worse, lead to unintentional weight gain. Read on to find out if you’re making some common smoothie mistakes, discover how to build the best smoothie and find nutritionist-approved recipes to get your smoothie-making up to speed. Whether blending a smoothie or smoothie bowl, here are some common traps you’ll want to avoid. You sip your smoothie with breakfast. If your smoothie contains protein powder, Greek yogurt, nut butters, and the like, there’s a good chance it contains enough calories to replace your meal rather than accompany it. If you enjoy a smoothie alongside your morning eats, you may want to reconsider your smoothie recipe to lighten your breakfast calorie load. You add too much fruit. Though fruit is a healthy smoothie ingredient, you can get too much of a good thing —i n the form of calories and carbs. A general rule of thumb is to stick to around 1 cup of fruit per smoothie. That’s about a serving. Putting a few different fruits in your blender can easily add up to much more so if you’re mixing fruits, keep an eye on the total amount. You’re not keeping tabs on added sweeteners. Be it maple syrup, honey, agave, coconut sugar, or any other form of added sugar, too much sweetener is where many smoothies go astray. Other added sugars may come in the form of plant-based milks (sometimes even in original varieties) and flavored yogurts. Since fruit is naturally sweet, see if you can get by with just a hint of added sugar, if any. You’re adding too many “boosters.” Nut butters, chia seeds, and protein powders can all be great smoothie additions, but like other smoothie ingredients, it’s possible to go overboard. A tablespoon of either peanut or almond butter has about 100 calories; protein powders often start in the 100-calorie range; and chia, flax, or hemp seeds get you to the 100-calorie mark in two or three tablespoons. If you aren’t careful with your add-ins, the calories can add up quickly. Though calorie needs vary depending on age, weight, hormones, activity levels, and more, as a rule of thumb, most of us do well with snacks that contain fewer than 200 calories; a 300- to 450-calorie breakfast would cover most adults’ needs. Here’s how to get the most nutrition without driving the calories sky high. Fruit. Start with 1 cup fresh or frozen fruit. Some great fruit bases include strawberries, blueberries, mangoes, bananas, pineapple, cherries and peaches. Veggie. If you don’t mind the green color, adding a handful of spinach or kale is a good way to bring more antioxidants to your drink. These greens also give your smoothie more body, but the flavor from the small serving is virtually undetectable when paired with fruit. Protein. I usually go for about ½ to 1 cup plain, Greek yogurt, which has up to 24 g of this hunger-busting nutrient. You could also use cottage cheese, silken tofu, or legumes, like chickpeas. Another way to go is to use protein powder. If you’re going this route, keep an eye on the labels and watch out for added or artificial sweeteners. You’ll also want to take note of the protein source, especially if you’re following certain dietary restrictions (like avoiding dairy or soy). Popular options include whey protein and pea protein, but you can also find almond protein, peanut protein, hemp protein, egg white protein, soy protein, brown rice protein, and others. When it comes to powders, simple ingredient lists are best. For example, Naked Nutrition’s Naked Whey lists just one ingredient: Whey Protein Concentrate. Plant-based fat. Nut butters, seeds (like chia, hemp or ground flax seeds), and avocados can make your smoothie extra filling, and depending on which one you choose, may bring heart-protecting omega-3 fatty acids or monounsaturated fats. But these additions also drive the calories up. Stick to about a tablespoon of seeds or nut butters or about a quarter of an avocado to avoid this issue. Liquid: Your choices include milk, non-dairy milk, coconut water, iced coffee or tea, and juice. If you want to punch up the protein, go for milk or pea protein milk, which contain 8 to 10 grams per cup. If you’re getting ample protein from another source, coconut water or almond milk are lighter ways to go. A splash of juice is a great way to add sweetness to your smoothie, but if you’re going this route, be mindful of other sweeteners. Flavor boosters: Flavorful sprinkles include cocoa powder, cinnamon, turmeric, ginger, and unsweetened matcha powder. These bring more complexity to your smoothie and can also bring other health benefits. Grains. Some people like the addition of oats or other fiber-rich grains in their smoothies. In addition to providing more body, you’ll get all the benefits of whole grains when you add them to your smoothie mixture or bowl. Ice. I like to toss a handful of ice cubes in the blender because ice adds more volume (read: bigger smoothie), which makes my sips last longer. The cold sips also take more time to drink. The more you linger over your smoothie (or any other meal or snack), the more memorable, satisfying, and enjoyable it will be. If you don’t want to use the above formula to guide your smoothie-making, try some of these recipes. Note that the serving sizes vary so you’ll want to keep an eye on that and adjust accordingly, depending on whether your smoothie is a snack, a meal or a side sip. Blackberry and lime make a refreshing and antioxidant-rich combo, while banana (a smoothie staple) keeps it full-bodied. The mixture of protein and milk bring a satisfying dose of protein to this AM meal. Sometimes it’s satisfying to eat with a spoon, which is where smoothie bowls come into play. Plus, crunchy toppings bring another appetizing dimension. You can use fresh or frozen peaches in this delectable smoothie, which gets its creaminess from the avocado. This treat would be a great between-meal tide-me-over that’s rich in fruits and veggies to help you meet your daily needs. This smoothie recipe has loads of flavor from fresh ginger and ground turmeric, along with the mango, orange, cucumber, and celery. Since it’s light on protein, you may want to consider this a snack or experiment with your protein of choice. Strawberry cheesecake? Yes, please! This decadent smoothie has just 5 good-for-you ingredients to get your day off to a great start. This two-serving sipper is a delicious way to help you reach your daily fruit and veggie requirements. Like many smoothies, you could blend it into a drink or a smoothie bowl. If you want to make more of a meal out of it, add protein-rich enhancers, like protein powder or Greek yogurt. This smoothie bowl packs 27 g of protein to power you through a long morning. Plus, wild blueberries are packed with antioxidants and fiber. If a non-dairy smoothie is more your style, this one, with plant-based protein powder, makes a delicious and filling meal. Cottage cheese provides the protein in this layered drink. It’s made parfait-style so the smoothie and cottage cheese are kept separate—perfect for days when you want to dig in with a spoon. 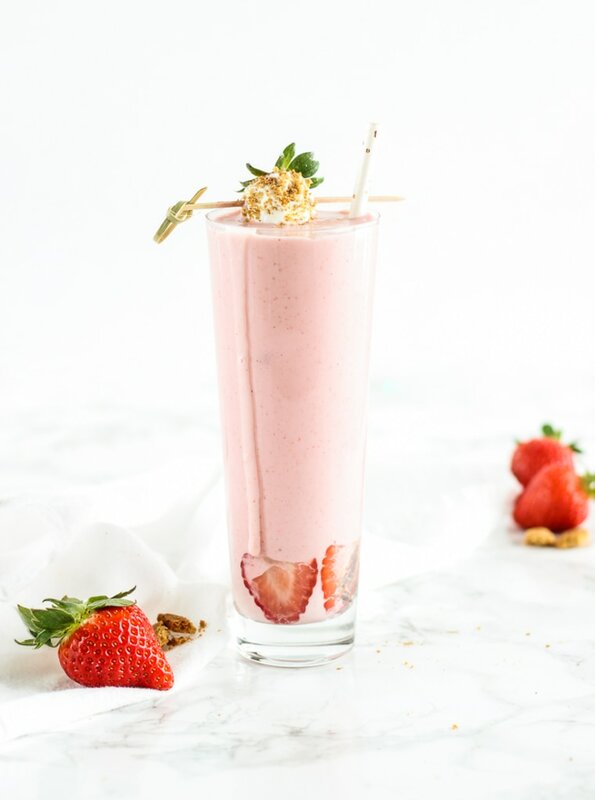 For the kids, or the kid in you, why not whirl up a little strawberry milk? Unlike the one you may have grown up on, this snack gets its pink color and juicy flavors from actual strawberries.